2017 New Product Lineup. Jack and Jill give the full rundown of new things coming! Jack Butala: 2017 New Product Lineup. Leave us your feedback for this podcast on iTunes and get the free ebook at landacademy.com, you don’t even have to read it. Thanks for listening. Jack Butala: Welcome to our show today this Tuesday. In this episode, Jill and I talk about our 2017 new product line ups for membership. Jack Butala: I love this. This is all I work on in my life. Jill DeWit: I know. This is so good. Jill DeWit: And our team can’t keep up. Jack Butala: They come out of my head faster than IT staff. Jill DeWit: I know. Oh my gosh like here it comes again. Don’t make eye contact, he’s going to give you a project. That’s really how it goes. I am the same way. Jack Butala: You’re exactly right. Jill DeWit: Don’t make eye contact, he’s going to say hey, you have some free time. Jill DeWit: Ryan asks, “I have a possible seller who’s a lilt hesitant. She’s asking how I come up with my offers.” This is awesome. “How do you recommend handling this question with sellers?” There’s a dart and a dart board and Mrs. What’s your name again? Smith? You came up in the red so I decided to start with an odd number and add with an even number. I don’t know. Could you imagine? Jack Butala: What would you say to that? What do you say? Jill DeWit: I pour over comps. I spent hours reviewing comps in your area. Jack Butala: Completed sales comparisons. Jill DeWit: Complete sells and values in your area Mrs. Smith, and I really try to accurately make educated offers based on a fair asking price and that I could get some kind of a profit, because I’m a whole saler, out of it. Jack Butala: That’s my answer. Jill DeWit: I’m here making a sincere offer and if you’re done with your property and then we go from there. That’s what I do. Jack Butala: My answer is more, we’re in a resale business and I say, if you want to check our website you’ll clearly understand that. If you’re just interested in getting rid of it in garage sale style, we’re interested in buying. Yes, I do know that it’s not a retail value offer. Just be real straight with them. This is our business. Jill DeWit: This is our business and what I say too is that part of the reason it’s priced this way is because I’m going to make this so darn easy I’m going to do all the work. Jack Butala: There you go. Jill DeWit: Whatever price we agree on or you agree on my offer price of 2,000 dollars, whatever it is, I will have a check to you … let’s see today is Tuesday. I can get a notary to you by Friday and have a check in your hand on Friday. I’m sincere and I mean that. Boy, when they see I’ve got 2,000 dollars on Friday, they forget everything else that they were talking about. Jack Butala: They forget that it’s a real estate deal. Jill DeWit: They don’t even really care. Jack Butala: There’s someone coming to my house with a 2,000 dollar cashiers check. Jill DeWit: I never have to think about this again. Jack Butala: I don’t get any more tax bills, property tax bills. Jack Butala: You’re real straight about it. Exactly Jill. Jill DeWit: … I think before they pick up the phone they do their homework. I think they really do. I think they go look at our site and they check us out before they pick up the phone. I wouldn’t pick up the phone without doing that. Jack Butala: Neither would I. I don’t do anything. I don’t buy anything or do anything unless I check online first. Jill DeWit: Research. I’m not calling them first to find out if they’re legit or anything. I’m first going to do my little homework and then I’m going to call them. Good question Ryan. Jack Butala: If you have a question or if you have a question or if you want to be on the show, reach out to either one of us on landacademy.com. Today’s topic is our 2017 new product line up. I now officially spend 8 to 10 hours a day, probably 7 days a week working on this topic, this exact what we’re going to talk about today. I’m glad we’re talking about it. In fact, the only time I don’t work on it is when we’re doing the show. Jill DeWit: Pretty much. You’re still doing it anyway. Let’s just be honest. Jack Butala: I’m actually skyping our IT staff during the show. Jill DeWit: I have to share. We had some house guests this weekend and I was feeling a little bit bad, but we can get out of it. Especially when we can get out of our world but you and I naturally talk about our companies and our business because we really do enjoy what we’re doing all the time. Jack Butala: We should stop. Jill DeWit: I don’t need a break but it’s hard with you and … you and I will sit in a restaurant and look around the restaurant and think of you a new business right then and there. Jill DeWit: Then we get excited and we just go on and on and on. It’s so funny. Our new product line up right now, as we’re sitting here preparing for the show, you listener know what went on. I had to cut him off. He’s like, let’s talk about this, let’s talk about … I’m like okay, hold on. Jack Butala: Oh right just now before the show. Jill DeWit: Just before the show Jack started to take this to another brainstorming session and I’m like, hold on a moment. Jack Butala: Maybe we could talk about some of our cockamamie ideas that .com hasn’t been put to it yet. Jill DeWit: You want to do the before or after? Jill DeWit: If we have enough time. Jack Butala: If we have enough after the show. Jill DeWit: We’ll throw out a few of the things that are in the works that, like your website stuff, that’s so cool. Jill DeWit: You want me to start? Jack Butala: Listener, if you go to landacademy.com, and you go to the membership plans, there’s different colors of membership plans, green, silver, gold, platinum, and then black level member at the end. It in incredible amount of detail outlines all of the new programs that we’re working on or the products that we will be providing and when they’re coming out. Not the minute they’re coming out but you get a basic feel for it. That’s really what we’re talking about today but it’s very detailed on the site. Jill DeWit: I’d like to add the reason we have those is just like everything else in our world, everything that we do is because people have asked us for this stuff. Jack Butala: We’re trying to make it easier. Jill DeWit: We started land academy because people were asking us will you please teach us. Okay sure. So we said teach us. Then they said we want to communicate with you. Okay, here came the online community. Now we need the products that you have. All right, here come the membership and all the products because it’s much cheaper for us to incur the whole cost for everybody, divide it all up, and we have access to the products we’re going to go through here, stuff that we’re creating to because it’s so much cheaper for everyone. My point, what I want to talk about is, real quick the different levels of membership are because again, our people have said we want this. Green is like the people who just joined our world. They don’t need much yet. They need the data, they need the cheap mailers, they need help with stuff. Jack Butala: Green is free. To join our group is free. Jill DeWit: Just to get in our world and be in our online community and stuff and just access to some training and community. Jack Butala: Access to the community, access to all our members, existing members who are succeeding at this. Jack Butala: It’s the same exact tools that we seek because we’ve been through all these stages also. We needed long before there were membership levels. We had to figure out a way to engineer properties faster and move them out of our inventory faster. That was the next level. Jill DeWit: That’s what’s coming up. As you see if you go to the membership page and you the gold and the silver and the black, that’s why we have those levels because now I’m doing … the gold person might be doing, I don’t know … how many deals a month do you think a gold person would be doing? Jack Butala: I think more than 10. Jill DeWit: Okay, more than 10 because now you’re needing phones and all that stuff. Jack Butala: You can’t do 10 … you can. You can do 10 deals yourself. There are certain personalities they have to touch everything and do everything. It’s real hard. You can buy 10 properties yourself no problem. You can’t buy engineer and sell 10 properties yourself. Jill DeWit: It’s hard to do. Jack Butala: You just can’t. Jill DeWit: With a full time job and a family then it gets hard. Jack Butala: There’s no way. There’s no way you could do it full time I don’t think. Jill DeWit: Platinum. Platinum, this is now becoming a business and taking over your stuff. We have plenty of people that are doing it. They’re really on that path. When we set out to do this, we had no idea how many people would be so successful and I could think of 2 people right now that got laid off from between a hundred thousand and 250 thousand dollar a year jobs and they’re like, yeah so what. Now I’m doing this full time. They already had it up and going. Jack Butala: One called me and thanked me. He said this is the greatest thing that ever happened was I got laid off. Jill DeWit: Exactly. They’re like, so what. Now I can really focus on this. I’m going for it. Jack Butala: Platinum level membership you get to use our money too. That and you get to use our custom made quarter million dollar CRM. We have not released that. Jill DeWit: But that’s coming. Jack Butala: We’re getting it all ready. Jill DeWit: In the black level I just want to explain that real quick. Do you want to explain that Jack? Because that’s the one I get calls on. Jack Butala: Do you really? Jill DeWit: Yeah, I do. Jack Butala: I didn’t know that. Jill DeWit: I have people that are like, how do I get to be black? My only thing about black is it’s basically, it’s a personal invitation from Jack saying, hey look … or you guys have been communicating. Jack Butala: It’s invite only. Jack Butala: Everyone has to start out as a green then silver member. You can’t just skate to black. Black is invite only and you have to have proven that … let me give you an example. We have a black level member in our group that in a southern part of the country, who came to me and said I have been subdividing property in two states, specifically in these counties and I’m thinking about joining your group. I said, great. I hope you do join and he did. He then called me, I don’t know, 3, 4 months later and said I’ve got a very large acreage property that I’m going to talk to the county. We can cut it into 40 acre properties, do you want in? I said congratulations you’re a black member because I love sub dividing. Subdividing is a way to print money. I don’t mean entitlement sub dividing, I mean rewriting the description. If you don’t know anything about that and really want to learn, go to our website and just key word that. Go to land academy and key word sub dividing. We’ve done shows about it. Jill DeWit: I just did a newsletter a couple of weeks ago just giving some of the basic numbers because we’ve done it on our weekly member calls. We talk to people about it. Anyway, so black is we’re doing deals together. It’s only because we have a track record with these people and they’ve been in our world for awhile. You got to get to that point where everybody trusts each other and we’re helping each other. Thank you. I wanted to explain a little bit. It’s cool. Jack Butala: We should probably do a whole show on the black level membership. Jill DeWit: That’d be awesome. Jack Butala: You know what we could do Jill? Honestly, I can tell this half way through the show already and we haven’t covered one percent of what we want to talk about. I’ll cut the show in half and I will, for the first time ever, there will be two land academy podcast episodes on the same day. I will release it in the afternoon after this. Jill DeWit: With the black stuff? Jack Butala: This is going to be two shows. 2017, what’s it called? Product line up. Jill DeWit: A and B? Jack Butala: Yeah, A and B. I’ll put two shows out on Tuesday. Jill DeWit: Are we going to go back to the product line up now and then get the black stuff later? Jill DeWit: Looking at those levels. We’ll cover that more this afternoon. Back to the new product line up. I have a list. Do you want me to down my list and then you add to it? Jack Butala: Yeah. Perfect. You break our whole company up listener, into 3 separate categories. Acquisitions, engineering, and sales. Acquisitions is obviously how you buy the property. You use the tools, you send out mailers, and you buy property very inexpensively on your own terms without negotiation hopefully. Engineering is okay we bought the property, let’s make some maps, let’s write a description. It’s incredibly important to present your property well on the internet. How many times have you ever gone to land watch, Craigslist and looked at a property, there’s no pictures, there’s nothing. There’s in the description a two sentence description and an email address. We don’t role that way. Neither do our members. The third part is sales. How you implement sales, why it’s important to take credit cards, and everything in between. When we say engineering, that’s what we mean. When we say sales, that’s what we mean. Go ahead Jill. Jill DeWit: The products, I was just going to cover big picture the things that we have going on here. I guess to tie it into what you said, for sales land pin. Land stay was our former company. You might still see land stand in some of our descriptions and things but that’s being changed over. Land stay is now land pin. Jack will you please share with us some numbers that you were looking at this weekend because it’s a month old. Jill DeWit: The hits and the one that’s about to get. Jack Butala: Land pin is a direct competitor to land watch. It will overtake land watch this year in the amount of traffic and the number of properties that are listed. 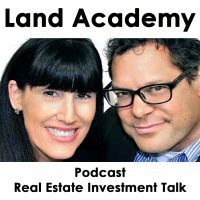 Land pin is a marketplace to sell property, to sell land. Farm land, ranch land, rural vacant property, infill lots, all of it. We were dissatisfied with our signature level at land watch. That was the birth of the product and land pin used to be land stand which was our sale site. It was a place where we sold our own property. A lot of people asked us, can we put our stuff on your site. For a long time we said we just can’t handle it from an IT stand point. Well now we can. If your not a member and you want to see other people’s property in our group, go to landpin.com and it’s pretty impressive. Jack Butala: And that’s coming. Jill DeWit: … for those people. It won’t be free. Right now for our members right now it’s totally free and it won’t be 500 dollars. That’s ridiculous. Jack Butala: It will be closer to a hundred. Jill DeWit: We don’t get a percentage by the way. I wanted to point that out too. A lot of people, you know like you sell property on eBay, eBay takes a cut. A lot of places take a cut. Jack Butala: People ask us that a lot. Jill DeWit: It’s just a tool and a resource for our people. I’m going to add something really good on there. This is the full disclosure, full transparency. I had a member reach out to me going, I’m looking on this list … we have a weekly platinum sellers list that goes out. He’s like, I see some of your properties on here but I can’t find them on land pin. Are they gone? I said, oh my gosh. I said, I got to tell you here’s the deal. I said, when land watch screwed me up and took off all my properties I haven’t gone back and reposted things yet. I said, you know what? I said, the bottom line is our members come first. I’m more concerned about their properties being up and available and posted all over land pin than I am about my own properties so they’re not up there. They haven’t caught up. Jack Butala: What happens is we have so many people involved now in our world buyers that they just buy trenches of property from us. The vast majority of the properties that we buy are sold before we actually even buy them because we’ve got these big people that they don’t even look at the lists I don’t think. They just say, yes we’ll take it all. Jill DeWit: Because we know what they want. We just have a relationship. I wanted to share that because it was funny. Is there anything else you want to say about land pin? Jack Butala: No, check it out. I purchased all the .coms. Jill DeWit: That’s what I wanted you to share. This is good information. Jack Butala: I purchased all the .com. So what happens in the .com world if you don’t know, is that there are a tremendous amount of … people type in, like for land watch they type in L-A-N-D-W-A-T-C .com. It’s an innocent spelling mistake. Or they type it into Google or they type directly into the URL and there’s a lot of different variations for every single website. Like eBay would be E-B-A-T. All those things, those .coms, a lot of them are available. I purchased all of them. I rerouted them all to land pin and our air traffic is … I have invested in all these .coms that are around that. I have maybe about 20 dollars invested in this entirely. Jill DeWit: I love it. It’s brilliant stuff. Jack Butala: We get about close to a hundred and 10 thousand hits on that site, on land pin which is still being developed by the way. Jill DeWit: Do you know how happy this makes me? Jack Butala: Just from that. Jill DeWit: I just think it’s the funniest thing. Jack Butala: Plus banner ads, the site is going to be huge. Jill DeWit: It makes me so darn happy. Jack Butala: It’s huge now. Jill DeWit: I love it. Good. All right so that’s land pin. I want to talk about our new product line up, our online community is going to be changing names. Don’t know when. Jack Butala: It’s called land clique. Jill DeWit: It will be land clique? Jack Butala: C-L-I-Q-U-E. Like clique in high school. We are land people. Jill DeWit: Cool. That’s going to happen this quarter. Jack Butala: Yes, that’s happening as we speak. Jack Butala: It’s a ground up website. Success plan is what it’s called now. Jill DeWit: That grew it. Jack Butala: It can’t manage the traffic. These are all good problems. Jill DeWit: It’s great. There’s no other place on the internet that you can go and really talk about rural, vacant, unimproved property. Not just that but we really talk about deeds and things like that. If you go on bare pockets, nobody’s talking about transferring property. All they’re talking about is a lot of finding property and all that good stuff. I see a lot of that. How do I find buyers? How do I find investors? How do I find that? We have no trouble with that. We don’t need that. I have so many people coming to me all the time wanting to invest. I have to say, thank you very much I don’t need your money. That’s not what I’m looking for. I know it’s the same with our people. We joke about that on our weekly call. How many of you have had your friends come to you and want to give you money? Everybody raises their hand. I’m like, no kidding. Seriously. We don’t need that. Jack Butala: Jill I’m going to cut you off. We’re going to do this show number two here in a minute. Jill DeWit: All right are we going to finish our list and everything then? Jill DeWit: This is going to be a fun Tuesday. Jack Butala: Show two. Show two. Jill DeWit: Tuesday part two. Coming up. Jack Butala: See you soon.